Colonial Knots are faster to make than French Knots and you can easily toss them in as a background filler while making the Scattered Seed stitch. Not as bulky as the French Knot, Colonial Knots add a concentrated hit of color on the fabric surface lending texture to a piece. Here’s how to make Colonial Knots: Begin the thread on the top of the fabric at A. Form a small loop like a backwards letter C with the thread. 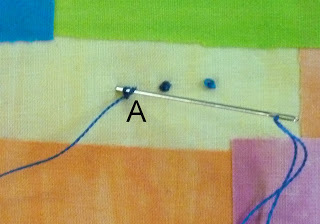 With the needle to the right of point A, slip the needle tip under the thread coming out of A. 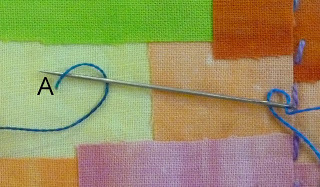 The shaft of the needle will lay on top of the lower end of the thread. 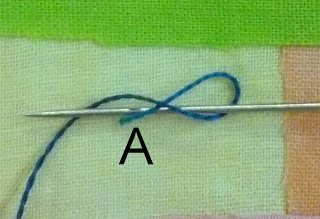 Shift the needle tip in front of point A. Wrap the thread across the needle and slip it under the tip of the needle. It should look like a figure 8 around the needle. 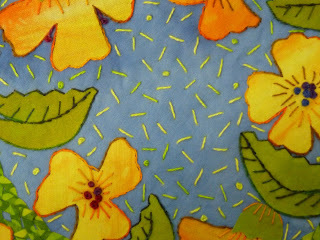 Gently pull the thread around the needle as you scoot the needle tip across the fabric to insert it back into the fabric. Insert the needle tip very close to point A. Draw the needle and thread through the fabric.